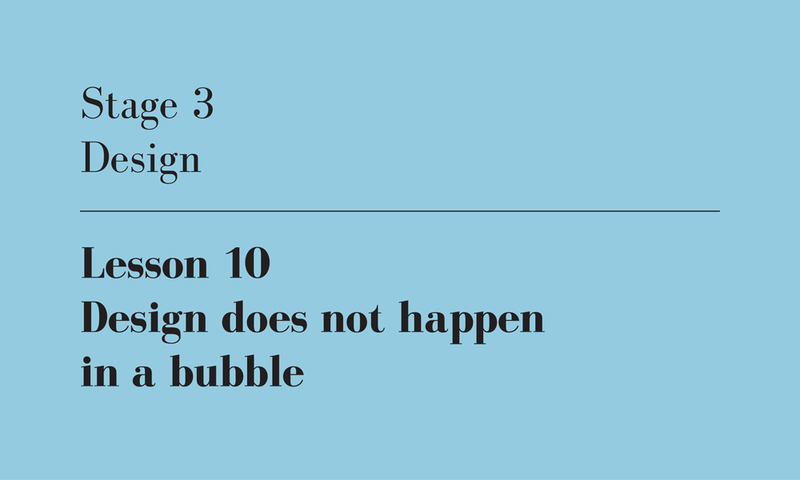 This is the 10th of twenty-one lessons for design students, gathered from the combined experience of being a student, and teaching students. I will published one lesson each weekday until they’re done. As you design, it’s tempting to wrap yourself in a protective bubble, to block off all the information clamouring to challenge, contradict and distract you. Bubbles are comforting, they give you control over the scope of your project. They let you say to yourself, All I have to worry about is this list of ten things, everything else I can ignore. But like an actual soap bubble, yours is highly likely to pop. Outside your bubble are things like the broader context of your site, structural engineering, materials and construction techniques. These things demand knowledge that goes well beyond SketchUp and Artlantis, and they will make your work harder not easier. But they will also make your design better. They will make it fuller, more detailed and more convincing. Your semester might stop with rendered images, but their intention is to communicate the idea of a finished building. And it’s all this extra stuff that finished buildings need. My first recommendation is to include the context of your site on every drawing, right from the beginning of semester. A floor plan floating in white space only tells me half the story, and it limits you in your understanding of how the edges of your building work. Does that big window look out on an open vista or a neighbour’s blank wall? Is that private area adjacent to a quiet courtyard or a petrol station? My second recommendation is to develop a feel for structure. You need to convey at least a rudimentary understanding of how your building will stand up. How thick are concrete slabs? Or concrete walls? Or timber walls? How far can a roof span? What are the proportions of a universal beam? What is a universal beam? Here are a few rules of thumb to get you started. This logic also applies for construction and materiality. Your bubble is truly your enemy here, as it stops you from appreciating how buildings are made. A white wall with vague texture could be anything, and I always test my students to see if they know what it is. One of my students a few years ago made it all the way to the end of semester and still hadn’t got around to working out how the structure of her building worked. Deep cantilevers had no structural support, roofs spanned vast distances without columns, floors and roofs were the same thickness as walls, materials were vague at best. As a result, her project looked unconvincing and she herself lost credibility. In contrast, my best students are always the ones who understand structure, construction and materials, who fold these things into their projects from the beginning. Please don’t use any of these rules of thumb as actual rules. They’re useful when you’re sketching ideas onto tracing paper, but you’ll need proper engineering input if you’re actually planning on building something. Design does not happen in a bubble, author’s own image.